ARBITRATION NOTICE: PLEASE BE AWARE THAT THESE TERMS CONTAIN AN ARBITRATION AGREEMENT IN SECTION 11. EXCEPT FOR CERTAIN TYPES OF DISPUTES MENTIONED IN THAT ARBITRATION CLAUSE, YOU AND CALI BAMBOO AGREE THAT DISPUTES BETWEEN US WILL BE RESOLVED BY MANDATORY BINDING ARBITRATION AND YOU AND CALI BAMBOO WAIVE ANY RIGHT TO PARTICIPATE IN A CLASS-ACTION LAWSUIT OR CLASS-WIDE ARBITRATION. 1. Your offer to purchase goods or services from Cali Bamboo, LLC (“Cali Bamboo” or the “Company”) and/or install Cali Bamboo goods is accepted solely upon the terms and conditions stated below (“Terms and Conditions”). Any additional or different terms and conditions proposed by you are rejected and shall have no effect. This order, when accepted by Cali Bamboo is not subject to cancellation or deferment of delivery. For the purposes of these Terms and Conditions, references to “Cali Bamboo”, the “Company”,”we” and “us” include our subsidiaries, affiliates, agents, officers, directors, employees, predecessors in interest, successors and assigns. References to the “Buyer,” “Customer,” “you” and “your” include the purchaser of Cali Bamboo goods or services as well as all authorized or unauthorized users or beneficiaries of services or products provided under these Terms and Conditions or any prior agreements between you and us. 2. One Hundred percent (100%) payment for product and shipping is due upon execution of order and prior to shipment. 3. Your receipt of any goods shall be an unqualified acceptance of and a waiver of any and all claims not made in writing to Company within seven (7) business days after such receipt. Defect of part of the merchandise shall not be grounds for rejection by Buyer of all of such merchandise, nor all of the particular item in which such defect is found, nor shall be grounds for the cancellation of the undelivered portions thereof. 4. Products are shipped via common carrier. Orders requested to be shipped via special carrier or air freight must be specified at time of ordering. All shipping charges will be the responsibility of the customer. The Company generally strives for transit times between 5-7 business days within the continental U.S. However, delivery within thirty (30) days of specified date, or delivery any time thereafter of shipments made prior to receipt of written notice of cancellation, shall constitute timely delivery. Company shall not be liable for any delay or failure of performance due to conditions or events beyond its reasonable control, including, without limitation natural disasters, accidents, acts of terrorism or civil unrest, labor disputes, shortages, ordinances, rules and regulations and inability to obtain material, equipment or transportation. If Company’s production of merchandise is curtailed or suspended, deliveries may, at Company’s option, be cancelled or be proportionately curtailed and then, at Company’s option, resumed upon the removal of the cause so interfering with production and continued until the entire quantity purchased hereunder has been delivered. Company shall have the right to allocate its available supply of goods among its customers and affiliates in such a manner as Company deems fair and equitable. 5. UNLESS EXPRESSLY PROVIDED IN A WRITING SIGNED BY THE PRESIDENT OF COMPANY, OTHER THAN THE COMPANY’S STANDARD LIMITED RESIDENTIAL FLOORING OR LIMITED COMMERCIAL FLOORING WARRANTY, AS APPLICABLE TO THE CUSTOMER’S PURCHASE, THE COMPANY MAKES NO REPRESENTATION OR WARRANTY, WITH RESPECT TO THE GOODS DESCRIBED HEREIN, INCLUDING WITHOUT LIMITATION ANY REPRESENTATION OR WARRANTY CONCERNING THE DESIGN, MANUFACTURE, USE OR PERFORMANCE OF ANY SUCH GOODS OR ANY IMPLIED WARRANTY OF MERCHANTABILITY OR FITNESS FOR A PARTICULAR PURPOSE. TO THE FULLEST EXTENT PERMITTED BY APPLICABLE LAW, COMPANY’S TOTAL LIABILITY FOR ANY COST, LOSS, DAMAGE OR OTHER POTENTIAL OR ACTUAL EXPENSES ARISING DIRECTLY OR INDIRECTLY OUT OF THE PURCHASE AND SALE OF THE GOODS DESCRIBED HEREIN SHALL NOT EXCEED THE PURCHASE PRICE PAID BY YOU FOR THE GOODS OR SERVICES WITH RESPECT TO WHICH ANY CLAIM IS MADE, REGARDLESS OF THE FORM OF THE ACTION, WHETHER IN CONTRACT, TORT OR OTHERWISE. IN NO EVENT SHALL COMPANY BE LIABLE IN ANY WAY FOR ANY CONSEQUENTIAL, ECONOMIC, SPECIAL, INCIDENTAL, OR INDIRECT DAMAGES (INCLUDING LOST PROFITS OR SAVINGS) EVEN IF COMPANY IS INFORMED OF OR IS OTHERWISE AWARE OR SHOULD BE AWARE OF THEIR LIKELIHOOD. SOME JURISDICTIONS DO NOT ALLOW FOR THE EXCLUSION OR LIMITATION OF INCIDENTAL OR CONSEQUENTIAL DAMAGES, SO THE ABOVE LIMITATIONS OR EXCLUSIONS MAY NOT APPLY TO YOU. THE FOREGOING DISCLAIMER OF DAMAGES FOR PERSONAL INJURY OR PROPERTY DAMAGE, OR FOR ANY INJURY CAUSED BY THE COMPANY’S FRAUD OR FRAUDULENT MISREPRESENTATION, SHALL NOT APPLY TO USERS WHO RESIDE IN THE STATE OF NEW JERSEY. 6. The risk of loss to the goods purchased by you from the Company and subject to these Terms and Conditions shall pass to you as soon as such goods are presented to a carrier for delivery to you. Title to the goods shall remain with Company until your tender of payment. Company cannot be held liable for damage or loss of shipment by a freight carrier. 7. Unless a Cali Bamboo warranty applies to the purchase or Cali Bamboo agrees to accept a return, all sales are final. Company cannot and does not assume responsibility for the errors of others. Products ordered incorrectly cannot be returned without prior approval. In the event Cali Bamboo agrees to accept a return, a “Return Authorization” form will be provided by Company and must accompany the product. All returns shall have freight and related costs prepaid by the customer from the point of origin. Returned product must be new and in marketable condition. Additionally, there will be a twenty-five percent (25%) restocking fee on all returned product. All freight charges are 100% non-refundable. 8. Orders are processed as they are received. Once they are put into production, add-ons may have to be treated as a new order and may delay shipment of the original order. Cancellations and/or change orders are subject to approval by Company. 9. Please refer to our limited warranty, which is incorporated by reference and which has been made available to you, and which is available here: https://www.calibamboo.com/content/warranties/flooring-residential-warranty.pdf. Without limiting the foregoing, please note the following with respect to the product you are purchasing. Bamboo is a natural product; each pole is unique and will vary in size, shape, taper, and color. All poles are expected to be within +/-20% of the range diameter specified at the time of sale. Bamboo is a wood product and subject to cracking, splitting and discoloration, none of which will affect its structural purpose. Bamboo can be subject to surface mold when used outdoors. If surface mold is noticed, the following steps are recommended to remove the mold: Pressure wash or scrub the bamboo surface. Let the bamboo dry and add a wood sealer with a fungicide. Bamboo is flammable. If Bamboo is to be used indoors, it is recommended that it be treated with a fire retardant. Fencing products contain galvanized steel wiring that can rust over time. With respect to bamboo flooring, you are required to strictly adhere to Cali Bamboo’s installation guide found online at http://www.calibamboo.com/bamboo-flooring-installation-guide.html). In addition, natural bamboo floors, like other wood floors, are subject to seasonal contraction and expansion, the occurrence of which is normal and not a flooring defect. It is the owner’s responsibility to provide and maintain appropriate humidity levels as specified based on the type of bamboo purchased (but most bamboo flooring requires a humidity range between 40% to 60%) via the use of humidifier and/or de-humidifier. The Company is not responsible for contraction or expansion of flooring caused by your failure to properly control the humidity level in your home. 10. Waiver by Company of a breach by you of any provision hereof shall not be deemed a waiver of future compliance therewith or of any other obligations of you under this agreement. (a) Scope of Arbitration Agreement. Cali Bamboo is committed to resolving all disputes in a fair, effective and cost-efficient manner. We primarily seek to resolve any customer concerns through our Cali Bamboo Support services at [[email protected]]. However, if you are dissatisfied with our Support service’s resolution of your complaint or if you do not wish to resolve your dispute with us informally, you may choose to resolve your claim pursuant to this Arbitration Agreement. You and Cali Bamboo agree that any disputes between us or claims against each other that arise from or relate to your purchase or use of any products or services manufactured, sold or distributed by Cali Bamboo, your use of any website or online service Cali Bamboo operates, these Terms and Conditions, or any other aspect of your relationship with Cali Bamboo, that are not resolved informally will be resolved by binding arbitration, rather than in court, except: (1) that either you or Cali Bamboo may assert claims in small claims court if such claims qualify, so long as the matter remains in such court and advances only on an individual (non-class, non-representative) basis; (2) that either you or Cali Bamboo may seek equitable relief in court for infringement or other misuse of intellectual property rights (such as trademarks, trade dress, domain names, trade secrets, copyrights, and patents), and (3) to the extent limited judicial proceedings or judicial review is otherwise expressly authorized by subsections (a)(1) or (d) of this Arbitration Agreement. (b) Arbitration Rules and Forum. This Arbitration Agreement is governed by the Federal Arbitration Act in all respects. To begin an arbitration proceeding, you must send a letter requesting arbitration and describing the claim and the relief sought to: Notice of Dispute, Cali Bamboo, 6675 Mesa Ridge Rd, Suite 100, San Diego, CA 92121. The arbitration will be conducted by JAMS under its rules and pursuant to these Terms and Conditions. Disputes involving claims and counterclaims under $250,000, not inclusive of attorneys’ fees and interest, shall be subject to JAMS’s most current version of the Streamlined Arbitration Rules and procedures available at http://www.jamsadr.com/rules-streamlinedarbitration/; all other claims shall be subject to JAMS’s most current version of the Comprehensive Arbitration Rules and Procedures, available at http://www.jamsadr.com/rules-comprehensive-arbitration/. JAMS’s rules are also available at www.jamsadr.com (under the Rules/Clauses tab) or by calling JAMS at 800-352-5267. If JAMS is not available to arbitrate, the parties will select an alternative arbitral forum. (c) Arbitration Fees. Payment of all filing, administration, and arbitrator fees will be governed by JAMS’s rules. If, however, the arbitrator finds that you cannot afford to pay your share of the JAMS’s filing, administrative, hearing and/or other fees and you cannot obtain a waiver of fees from JAMS, Cali Bamboo will pay them for you. Cali Bamboo will also advance all such JAMS’s filing, administrative, hearing and/or other fees for claims totaling less than $10,000 and you will have no obligation to repay us for such fees, unless the arbitrator determines that your claims or the relief sought are frivolous or brought for an improper purpose. Cali Bamboo will not seek attorneys’ fees or costs from you in arbitration unless the arbitrator determines that your claims or the relief sought are frivolous. 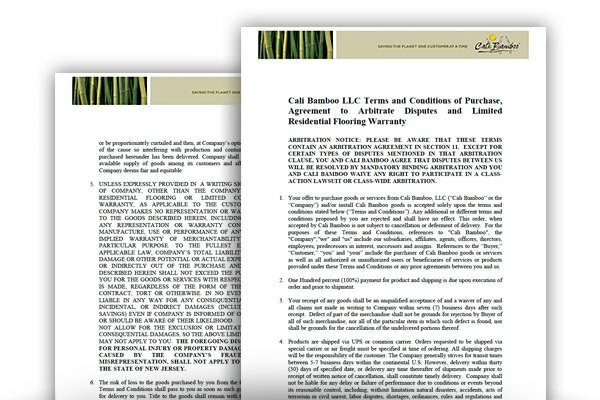 Under no circumstances will you be required to pay Cali Bamboo’s share of the arbitration costs if the arbitration takes place in California or another jurisdiction that prohibits consumers from being required to pay for any portion of Cali Bamboo’s arbitration costs. (d) Arbitrator Powers. You and Cali Bamboo agree that any argument that any part of the waiver of class, consolidated and representative claims set forth in subsections (a)(1) and (i) of this Arbitration Agreement is unenforceable, unconscionable, void, or voidable may be decided only by a court of competent jurisdiction and not by an arbitrator. Otherwise, the arbitrator, and not any federal, state, or local court or agency, shall have exclusive authority to resolve any dispute relating to the interpretation, applicability, enforceability or formation of this Arbitration Agreement including, but not limited to any claim that all or any other part of this Arbitration Agreement is void or voidable. The arbitration will decide the rights and liabilities, if any, of you and Cali Bamboo. The arbitration proceeding cannot be consolidated with any other matters or joined with any other proceedings or parties. The arbitrator will have the authority to grant motions dispositive of all or part of any claim or dispute. The arbitrator will have the authority to award monetary damages and to grant any non-monetary remedy or relief available to a party under applicable law, the arbitral forum’s rules, and these Terms and Conditions (including this Arbitration Agreement). The arbitrator will issue a written statement of decision describing the essential findings and conclusions on which any award (or decision not to render an award) is based, including the calculation of any damages awarded. The arbitrator has the same authority to award relief on an individual basis that a judge in a court of law would have. The arbitrator’s decision is final and binding on you and Cali Bamboo except that the arbitrator shall not have the power to commit errors of law or legal reasoning, and the parties agree that any injunctive award may be vacated or corrected on appeal by either party to a court of competent jurisdiction for any such error. Each party will bear its own costs and fees on any such appeal. (e) Form of Proceedings. For claims seeking damages in the amount of $10,000 or less, you may choose whether the arbitration will be conducted solely on the basis of documents submitted to the arbitrator, by a telephonic hearing or by an in-person hearing as established by the JAMS rules. If you choose to proceed either by an in-person hearing or by telephone, Cali Bamboo may choose to respond only by telephone or document submission. If your claim seeks damages greater than $10,000 but less than $25,000, you may choose whether the arbitration will be conducted by a telephonic hearing or by an in-person hearing as established by the JAMS rules. If you choose to proceed in person, Cali Bamboo may choose to appear by telephone. If your claim seeks damages in excess of $25,000, the arbitration will be conducted by an in-person hearing, although witnesses may still appear telephonically or through deposition testimony if the parties stipulate or if permitted by the arbitrator. (g) Effect of Arbitration findings on Other Disputes. You and Cali Bamboo agree that any awards or findings of fact or conclusions of law made in an arbitration of a particular claim or dispute between us are made only for the purposes of that arbitration and may not be used by any other person or entity in any later arbitration of any dispute or claim involving Cali Bamboo. You and we agree that in any arbitration of a dispute or claim, neither of us will rely for preclusive effect on any award or finding of fact or conclusion of law made in any other arbitration of any dispute or claim to which we were a party. An award may be entered against a party who fails to appear at a duly noticed hearing. (h) Waiver of Jury Trial. YOU AND CALI BAMBOO WAIVE ANY CONSTITUTIONAL AND STATUTORY RIGHTS TO SUE IN COURT (OTHER THAN SMALL CLAIMS COURT) AND RECEIVE A JUDGE OR JURY TRIAL. You and Cali Bamboo are instead electing to have claims and disputes resolved by arbitration, except as specified in subsection (a) above. An arbitrator can award on an individual basis the same damages and individual relief as a court and must follow these Terms and Conditions as a court would. However, there is no judge or jury in arbitration, and court review of an arbitration award is limited. (k) Survival. This Arbitration Agreement will survive any termination of your relationship with Cali Bamboo. (l) Construction. All issues, including the scope and enforceability of this Arbitration Agreement, are for the arbitrator to decide. (m) Modification. Notwithstanding any provision in the Terms and Conditions to the contrary, we agree that if Cali Bamboo makes any future material change to this Arbitration Agreement, it will not apply to any individual claim(s) that you had already provided notice of to us. (n) Exclusive Venue. To the extent the parties are permitted under this Arbitration Agreement to initiate litigation of any claims in a court, both you and the Company agree that any such claims will be litigated exclusively in the state or federal courts located in San Diego, California. (a) Choice of Law. These Terms and Conditions are governed by the Federal Arbitration Act, applicable federal law, and the laws of the State of California, without regard to its conflict of laws principles. (b) Severability. Except as otherwise expressly provided herein, if any provision of these Terms and Conditions is found to be invalid, the invalidity of such provision shall not affect the validity of the remaining provisions, which shall remain in full force and effect. (c) Consumer Complaints. In accordance with California Civil Code § 1789.3, you may report complaints to the Complaint Assistance Unit of the Division of Consumer Services of the California Department of Consumer Affairs by contacting them in writing at 400 R Street, Sacramento, CA 95814, or by telephone at (800) 952-5210.